Since Roger the Vintner sold ale and wine in 1175 to the burgesses of the new borough of Scarborough this town has imported wine, and until recent years, brewed ale. The early Normans brought the taste for wine, after their conquest of England, and to meet their needs Gascon ships supplied to the haven at Scarborough. When a Norman king planned to visit the town in 1251, he ordered the sheriff to lay in ten tuns of wine against his arrival in these parts. While Inns and taverns sold wine, alehouses met the needs of the ordinary people, and supplied the native drink. As a sea port, Scarborough, had countless ale houses clustered around Sandside. When hopped beer began to be made, the town became a noted centre for malting, and exported malt to Newcastle and London. Complaints were sent to the bailiffs and burgesses of the "evil and deceiptfull" malt dispatched from Scarborough. Seamers yoemen complained in the sixteenth century that the men of Scarborough had forsaken their old pursuits at sea, and taken to malting. Each gentlemen's house in the old town had its brewery, as did many of the common ale houses. In their wills the yoemen left their kilns, the brewing vessels, and sometimes even their licence to favoured children. When Scarborough began to be visited for both health and pleasure, both breweries and ale houses prospered. While the larger inns enjoyed undreamt of good fortune. Not only did they provide wine to suit the Geogian gentlemen's taste, they even fed his horses, bedded his servants, and sent meals out to his lodgings. The Golden Ball, in Quay Street, was one of the better known inns. Of great age, it was noted for the "prime old ales" produced on the 30th September every year, St Jeromes Day, and the occasion for the election of new bailiffs at the nearby town hall. A brewery adjoined the house, where in 1821, Mark Coates fell into the mash tub. The Inn was eventually destroyed by the Gas Company. Most of the public houses of Sandside and Quay Street drew custom from their fishermen, and from visiting ships. Outgoing vessels were provisioned here, and for centuries the dutch ships which fished the Dogger Bank poured their seamen ashore while the catch was unloaded. The front was a galaxy of signs designed to attract men of the sea. The Sailors Return, the Newcastle Packet, The Three Mariners, the Old Buoy, and the Hope and Anchor awaited their return. The Old Globe Inn, Globe Street, one of the oldest town Inns, it attracted farmers coming to market, and later on the national nobility who came to visit the Spaw. In 1733, the dinner served at 2 O'clock offered 10 or 12 dishes inluding fish, rabbits mutton, and poultry. Spaw waters were supplied for drinking at the same time as the wine, and mixed with it. The towns local government was in some measure conducted at the Inn. The new political Association met here. A Freemason's lodge was built at its site in 1797. The first Royal Mail coach drove into the Globes stables and it became a noted coaching house. Here met the Scarborough Reform Association during the reform acts excitement. The Operatives society also met here. Bartholomew Johnson, the 100 year old musician from Wykeham, played a minuet of his own composition to a distinguished gathering of gentlemen at the old Globe in 1810. In its Georgian heyday, the Inn saw recitations, musical evenings, presentations, and political agitations. The increased duties on spirits, and the growth of the gin-habit, brought spirit shops alongside the beerhouses. National Governments vainly tried to stop the traffic but only succeeded in driving it underground. Illicit stills and smuggling became the order of the day. Only when revenue cutters were stationed at the harbour mouth were the imports checked. Too often, the cutters had to dash off to Hayburn Wyke, Cloughton, or Cayton Landing, and then some lugger would put in loaded with contraband. Scarboroughs own haven became a principal landing place for brandy and geneva. Customs Officials were frequently replaced, charged with involvement in the trade that they were there to prevent. Inns like the Golden Last in Carr Street kept a hogshead let into the hearth of the kitchen floor, in which gin flasks could be kept out of sight and mind. Even the boiler in Tindall's shipyard was used as a store. Poistchaises were kept by the Sandside Inns whisked spirits away inland whenever the coast seemed clear. Much was recaptured but even more escaped. The Duke of Wellington passed laws which helped to reduce spirit drinking, but only by making beer more popular. Licenses for beer selling were made cheap and easy to obtain. Through Queen Victoria's reign, Scarboroughs beer shops expanded in their number until there were dozens dotted about the town. To supply them distant breweries established agencies with the wine merchants. 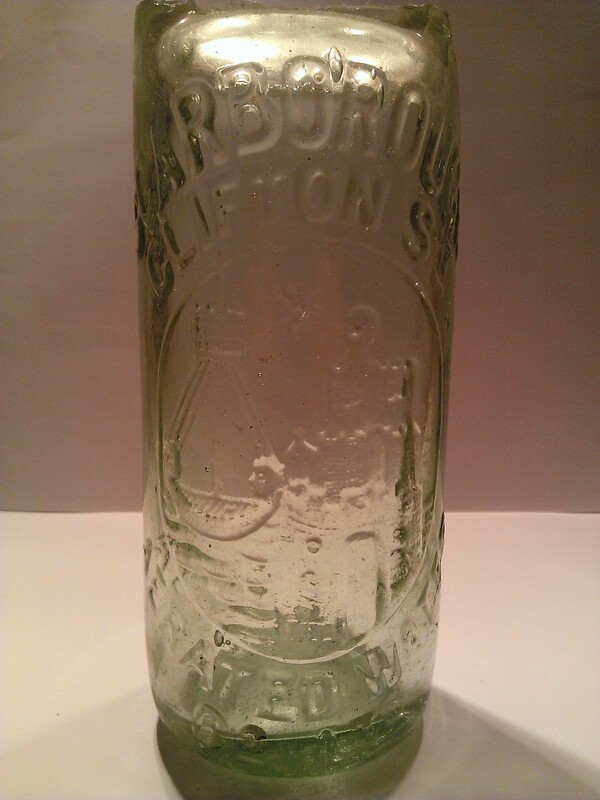 Tetleys sparkling ales were retailed in Westborough, Newborough, and South Street at 1/- to 1/8 a gallon. Worthington, Bentley, and Alsopp all brought beer to Scarborough, much of it bottled on their local premises. The three local breweries competed vigorously, and tied houses became the rule, freehouses the exception. After 1869, a more stringent licensing policy began to reduce the number of licenses. The Victorian religious revival brought visitors less inclined to spend their holiday entirely in the tap room, and reinforced the efforts that the temperance reformers had been making for twenty or thirty years. Every church and every Sunday School supplied tracts against 'The drink'. Pledge cards, and alternative meeting places with tea, coffee and cocoa. There were great temperance meetings in the rock gardens in 1841, and by the sixties it was possible to build a Temperance Hall in North Street with reading room, lecture room, and newspapers. Behind the campaigns, if not because of them, habits and opportunities were slowly being effected. As the beerhouses and ginshops closed, the public houses that remained faced competition. Their premises were improved and they increasingly came into breweries hands. Sawdust and spitoons gave way to hard floors and linoleum. Houses were rebuilt and in most cases little remains to recall their past. In an age of literacy, old signs have become irrelevant, and even inn names have been changed. No longer do the "Sheperd and Sheep", the "Shipwrights Arms" carry any message for some particular clientele. To todays visitor, one pub may be almost as good as another. Indeed with similar wallpaper, similar fireplaces, and similar plastic advertisements. It is an outstanding landlord who can give his House any identity at all. - "Scarborough's heydays of inns,smuggling and illicit stills". By John Rushton. Based on an essay published in the Scarborough Evening News on 1st January 1965. 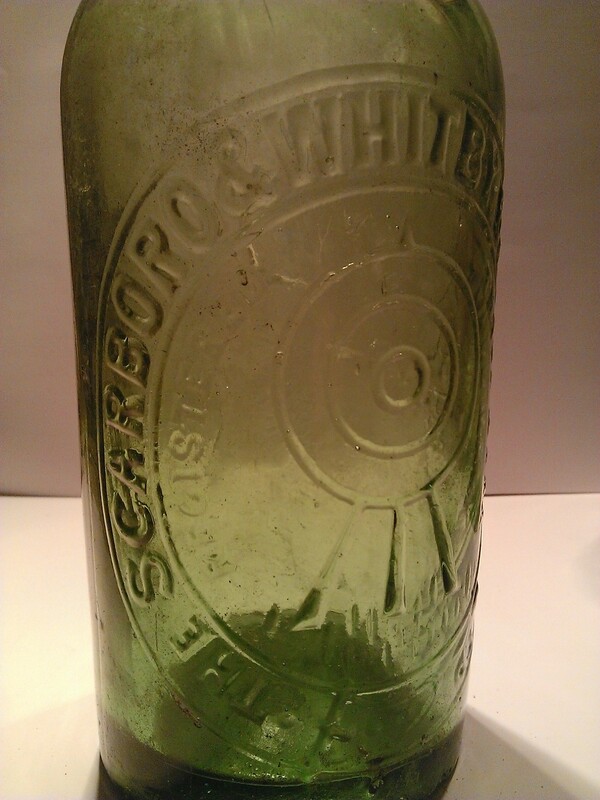 Below - Two Scarborough brewery bottles found at the Mere.